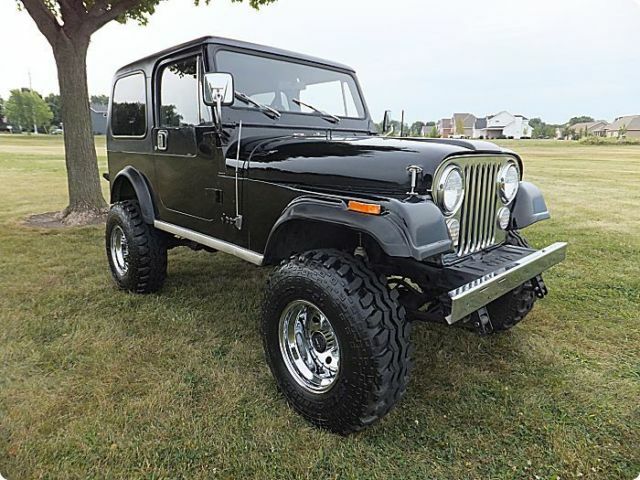 1983 Jeep CJ7 Laredo. Drive train features a 5.7 350CI TBI V8. It still has the original 4 speed manual transmission. The V8 conversion was nicely done. It runs, drives, and rides great with no abnormal issues. Motor has no smoke, noise, or hard starting issues. The transmission, transfer case, and clutch work great as well. The service department here did a full service and inspection. All checked out good. We did however replace the A/C Compressor. The wiring is nicely done along with the ECM is installed behind the glove box. It passed California emissions and inspection recently. Also it did have current California registration. Exterior features a nicely done suspension lift (No body lift). All the panels, hard top, doors, etc... seem to be all original metal. The steel chrome wheels are rust free and are wrapped in new 33" Tires. You will not find a spec of rust anywhere nor has there ever been any repaired. Honestly it is in perfect rust free condition. The paint is very thin on the hood and the overall paint finish is poor. The paint is obviously not original, but it is the original color. The interior seems to be all original and everything is there. Everything works with exception to the radio and the tachometer is about 1K RPM off. All gauges, lights, heat, AIR, etc... are in working order. The seats are the factory Laredo two tone high back bucket seats with center console. The rear seat as well is there. Some of the Laredo options are tilt wheel, air, leather grab bar, clock, tachometer, dash pin stripe, high back two tone bucket seats, stainless grille, and bumpers. We bought this jeep in California where it has lived its whole life. This would make a perfect driver or a great starter for someone looking to restore one. The clean California title is in hand. I don't think the pictures could be more clear to what this jeep is. Please take your time looking over all the pictures over before bidding. WE USUALLY SELL OUR VEHICLES BEFORE THE AUCTION ENDS. SO IF YOU ARE INTERESTED YOU NEED TO CALL ME AT 815 830 6184. EMAILS WILL NOT BE REPLIED TO. All Titles are held till ANY form of check has cleared. All sales are final with no returns or warrarnty. All titles are in hand and clear along with free of any liens. We are a Illinois licensed used Auto, Trailer, and Motorcycle dealer. Deposit of $1000 is to made made within 24 hours after auction. Depoist can be made by cerfified check, wire transfer, or credit card. We have to collect tax for the following states AZ (5.60%) CA (6.25%) FL (6.00%) IL (6.25%) IN (6.25%) MA (5.00) MI (6.00%) SC (5.00%) Drive away stickers are available. There will be a $100 Doc Fee added to price of vehicle. MJ Autowerks LLC is committed to providing customers with the most courteous personal attention and the finest quality pre-owned cars and trucks. Our highly trained sales staff has earned a credible reputation with their many years of service and commitment. Our goal is to make sure that each of our customers receive the quality service that we have built our name on. Most vehicles are from the West and Northwest regions and we will ship coast to coast upon purchase. All we need is an address and we can have your new vehicle dropped at your door. We are one of the most reputable, well-respected auto dealers in North Central Illinois and also online. Michael and Brian are too of the most honest and straight up guys in the business. We run a small hassle free dealership along with don't have the stories or play the numbers game. We are both just a phone call away!